Our group of the Australian Sewing Guild had the last meeting for the year on Sunday, and had a Christmas gift swap. 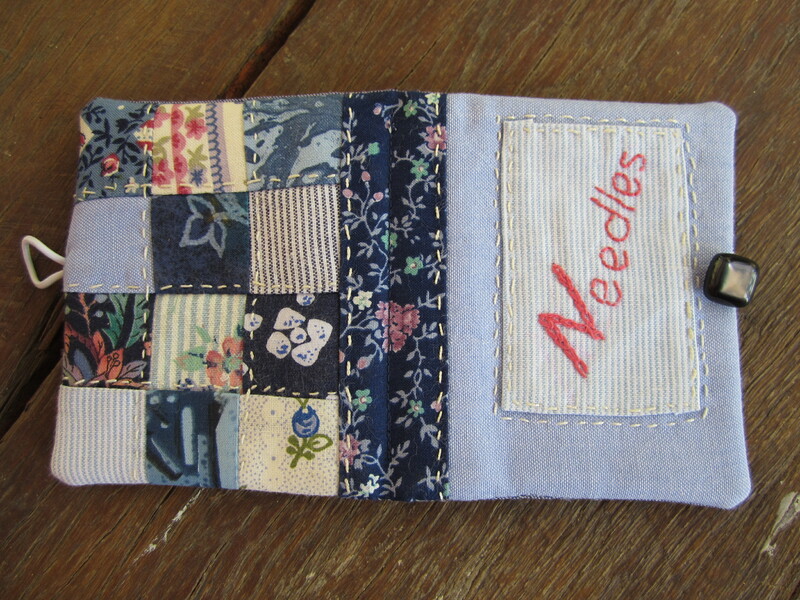 I always like to make something for these swaps, and so this year I did a needle book, following a tutorial by Nana Company. 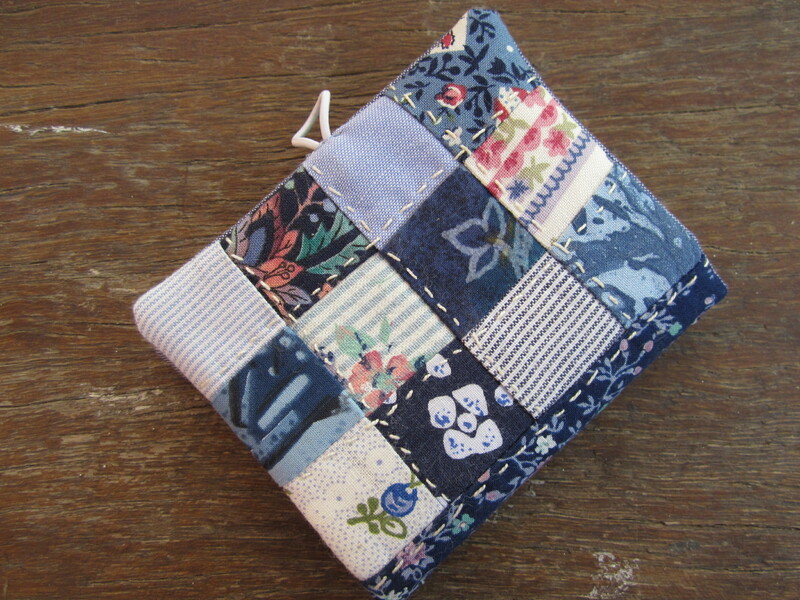 It uses some tiny bits of fabric, 1.5 inch squares, so I was easily able to find some in my scrap box. Actually I think I have enough scraps in the scrap box to make at least a hundred of these, but that’s probably not going to happen! 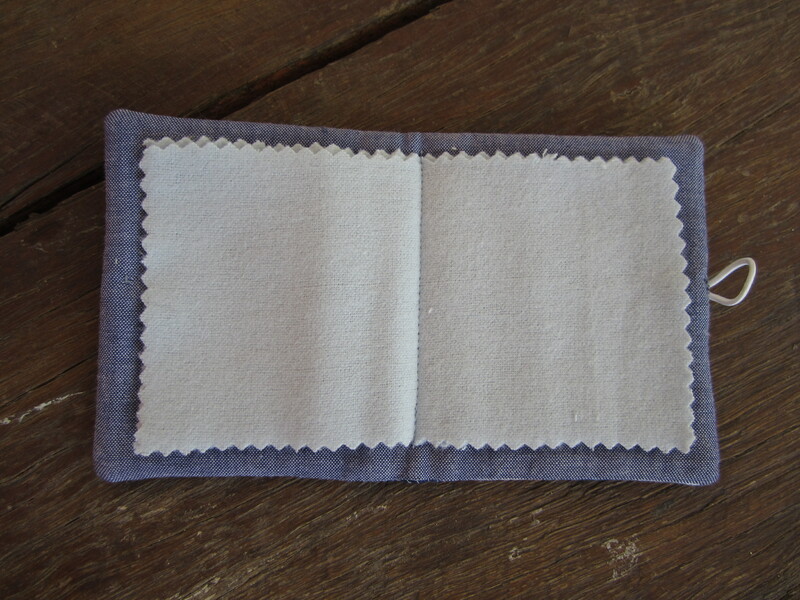 I had to buy some flannel, or at least it was flannelette, to use for the pages, and I bought pale blue instead of the more usual white or cream. There was white in the shop, but although they were both labelled the same the blue was definitely thicker, so I thought it would be better. Not sure of the difference between flannel and flannelette, I guess the latter is probably just thinner. 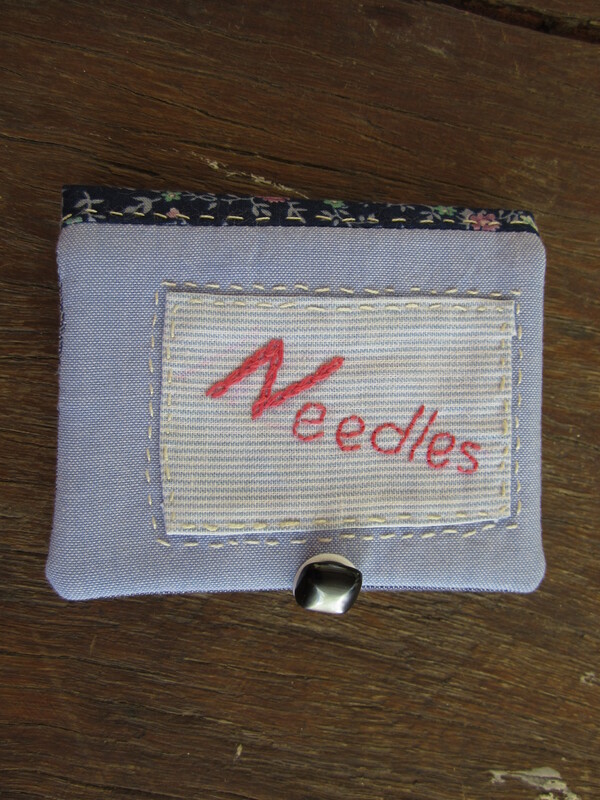 I was quite pleased when it was done, but what doesn’t really show in the photos, but does in real life, is the fact that I originally put the transfer of the word ‘Needles’ on the wrong way up, so the wording was reversed. I turned the fabric over, and did it on the other side, but the mistake does show a bit, and I should have just cut a new piece of fabric instead. A lesson in being more careful, even if it is late at night! Another member made some really cute sewing weights, which is something I’ve never used, I always pin my patterns. Sometime though I’m going to make myself some and give them a try. I remember long ago a reader of Threads magazine wrote that she used hockey pucks as pattern weights, because ‘they were readily available at garage sales’ in her neighbourhood. Not in Western Australia they aren’t! But the ones I saw on Sunday had fishing weights inside them, that’s what’s readily available around here! 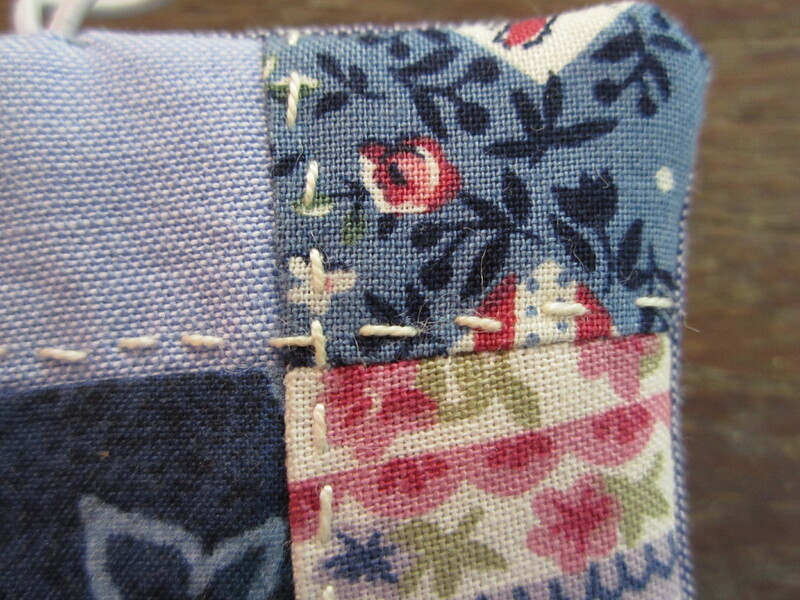 I’m going to be interested to try out the difference between pinning patterns and using weights. Early last year I took a course called Introduction to Fashion Design, or something like that, at Central TAFE in Perth. I had been going to do Fashion Illustration, but there weren’t enough enrolments for that class to run. So I ended up doing fashion design. Only a short course, one evening a week for 8 weeks I think, but it was very interesting. It was intended as an introductory course for people who actually want to become fashion designers, and covered things like branding, trends in colour and design, and how to present your collection on a story board, which is where the drawing came in. I find it very difficult to draw realistically, but in fact for fashion illustration that doesn’t really matter, many of the best illustrators have a very representational style, if that’s the word I want. A few lines and splodges, and they can convey enough about a garment that you can picture it in your head. Like this for example. 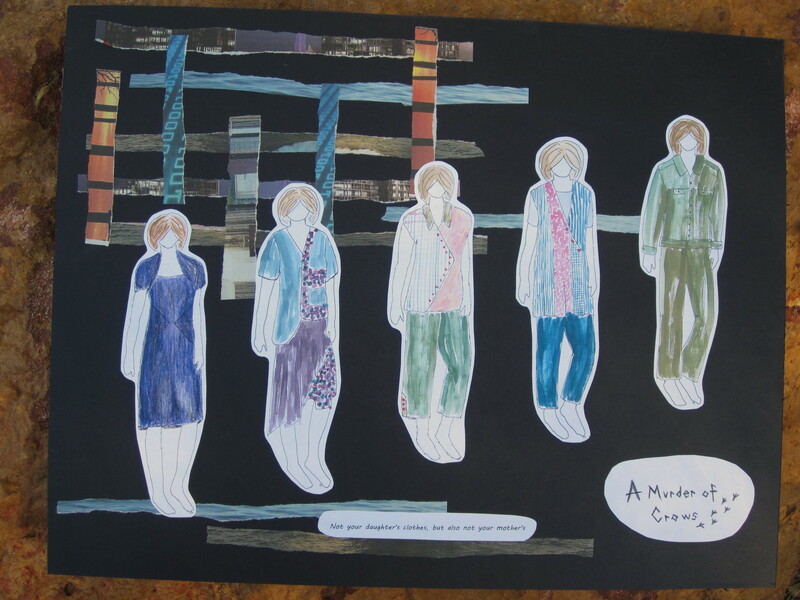 Each student developed their own style, and they were very varied. In line with my very down to earth character, mine was pretty simple and straightforward. I also had a problem with the conventional figure that fashion drawings are based on, you know the skinny one with the extra long legs. Real women don’t look like that for heaven’s sake! I did download some templates from Fashionary, but I ended up not using them and drawing my figures in more realistic proportions. In fact I used photos out of a magazine to base them on, so I know they look more like real women. I have to admit though, that they do look a bit dumpy, but I’m telling myself that’s because we are all so conditioned to seeing figures with endless legs. Also in the course, we designed our own logo, having first come up with a brand name. I thought of mine, A Murder of Crows, because one morning when I was leaving home to go to work there was a murder of crows in the front paddock. 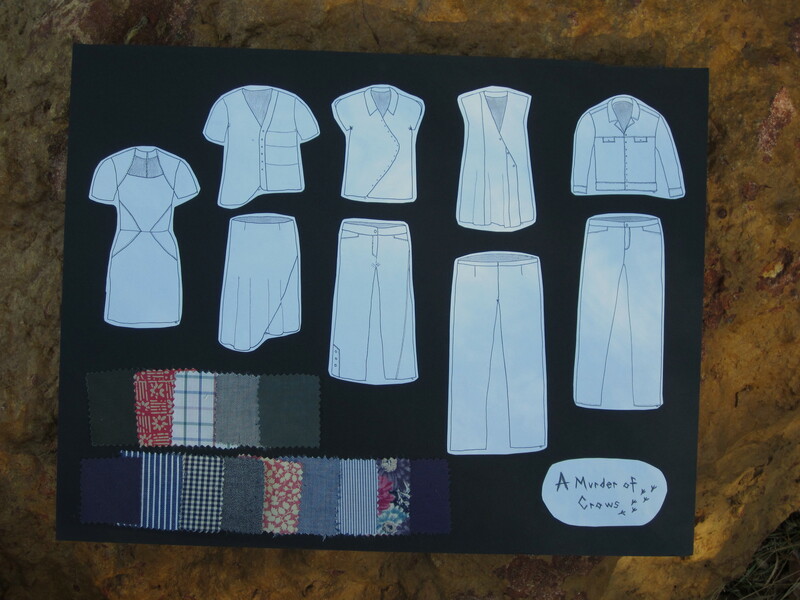 I afterwards thought of the connection that since I was designing a collection for ‘mature’ women, these clothes might also help them to forget (murder) their crows’ feet. A tenuous connection I admit. I found the flat drawings much easier to do than the people wearing the clothes, or even the clothes on people. Probably because I know how clothes are put together, and also because they are two dimensional. All in all, it was an interesting and worthwhile course, I think not least because I was giving myself permission to just play around with drawing.